Winter is on it’s way and for many you that means spending time with your family at home baking cookies, writing holiday cards, and maybe making a holiday craft or two…kind of a dreamy way to spend a snowy day inside with your kids right? Unless of course it doesn’t even snow where you live…like in sunny LA… but hey, a girl can dream! 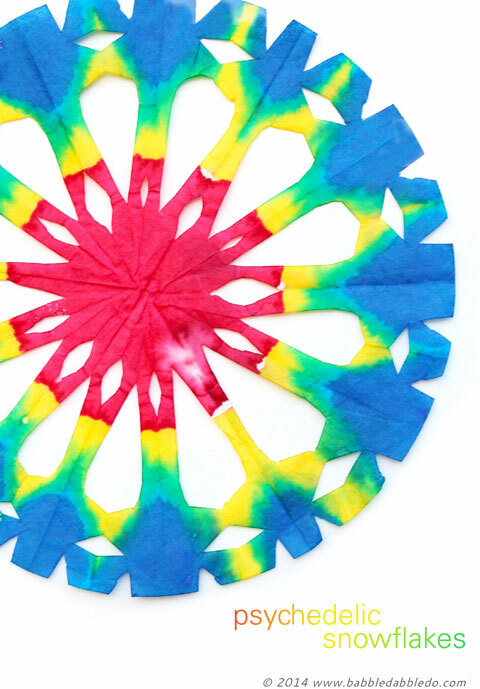 Today’s Snowflake Craft idea, Psychedelic Snowflakes, is not only a gorgeous way to decorate your home this winter, but there is a little STEAM twist to the project; I couldn’t help but turn it into a lesson on absorption…. This project was borne out of a spur of the moment purchase of 1,000 large coffee filters. I knew they would eventually come in handy! 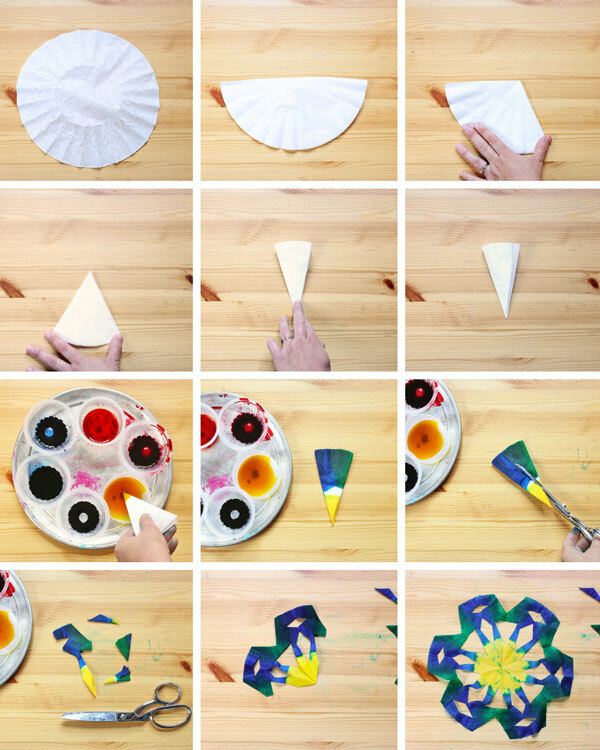 Coffee filters are PERFECT for making paper snowflakes. 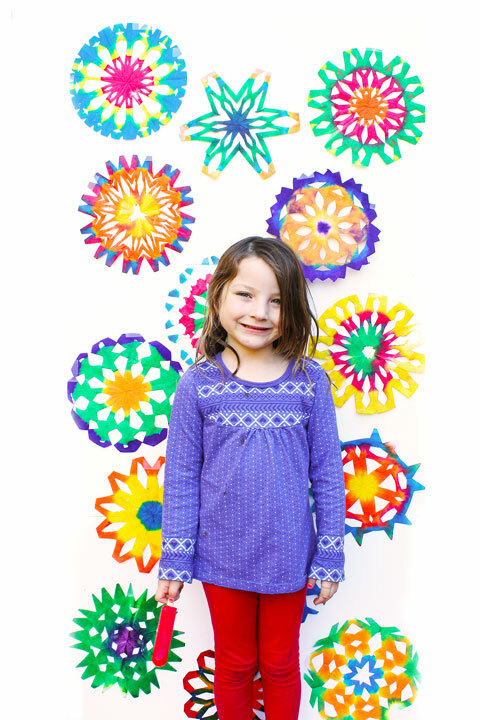 The round shape and lightweight material make them easy to fold and cut. Just be aware that in this project we are dipping them into watercolors first and they do end up being wet, making them harder to cut for little ones. A Note on Safety: The cutting portion of this project is appropriate for kids 10+ and grown-ups. The wet snowflakes are easily cut with sharp scissors but dull scissors will not work. And please be sure to only try this with older kids who can use sharp scissors safely. After reading the safety note you might be inclined to shelve this idea until the kids area little bit older but wait! 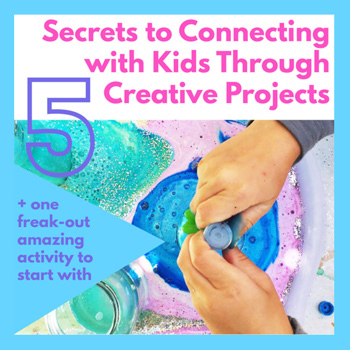 Younger children can totally participate! Your littler ones can be in charge of folding and dipping the filters in color and older kids and parents can be in charge of the cutting. 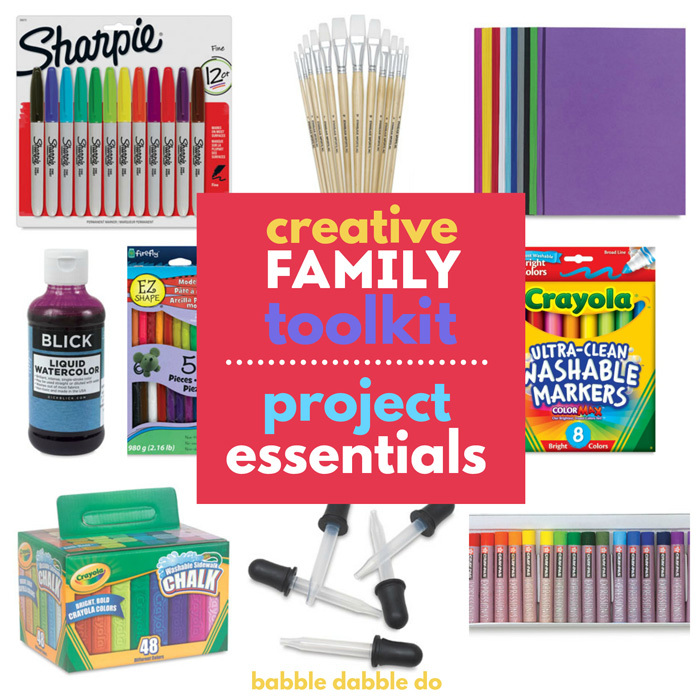 This would make a wonderful family activity for the whole family! Liquid Watercolors – You may substitute food coloring but be sure to go to your local Smart & Final and pick up the large bottles. You will need a fair amount! ABOUT LIQUID WATERCOLORS: Liquid Watercolors are one of our favorite art supplies. They yield vibrant, stunning color and can be used for many art projects. They are on the pricier side to purchase upfront but you will not be disappointed with the investment. You can start with smaller 1 oz. sets like this for under $20 but I recommend paying a little more and getting an 8 oz. set. Click here to see the set I recommend It’s less than double the price and you get 8 times the amount of watercolor. MESS ALERT! 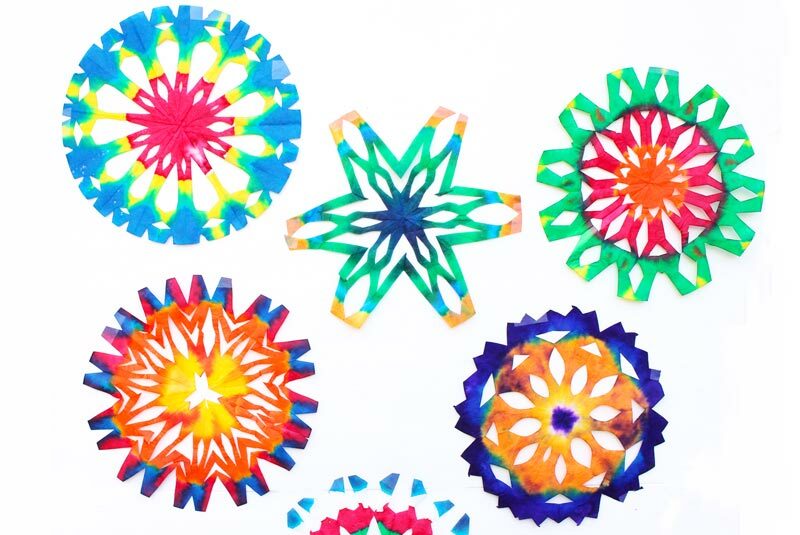 Be sure to layout pieces of tissue paper or newsprint down for the finished snowflakes to dry on. The undiluted watercolor can stain the surface below. Step 1 Fold your coffee filter in half. Step 3 Repeat the 60-degree fold with other side of the paper. Step 4 Fold in half for a six sided snowflake. You can fold it in half AGAIN if you want a 12-sided snowflake. Step One Squeeze a generous amount of each liquid watercolor into separate plastic cups. DO NOT DILUTE! 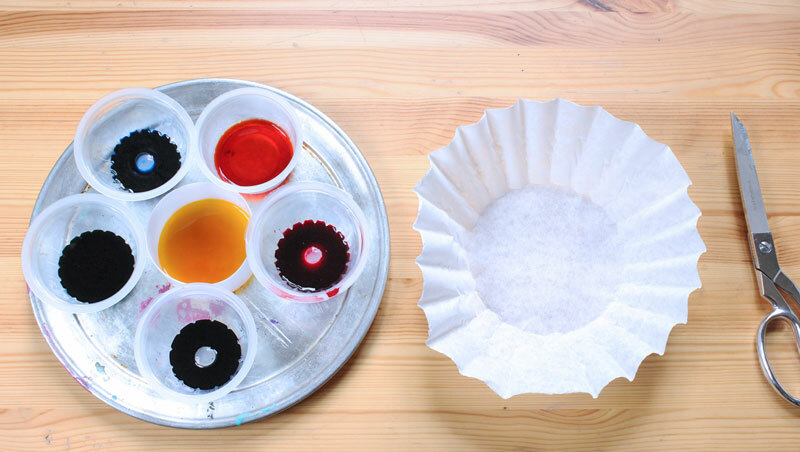 Step Two Dip the folded coffee filter briefly into the colors of your choice until it begins to absorb the color. I recommend using 3-4 colors max. Leaving some white is also pretty. You can fold the filter in half gently to dip the center section. Step Three When the filter is colored it’s time to cut! Cut these while they are wet! I free form cut shapes out to create our snowflakes. 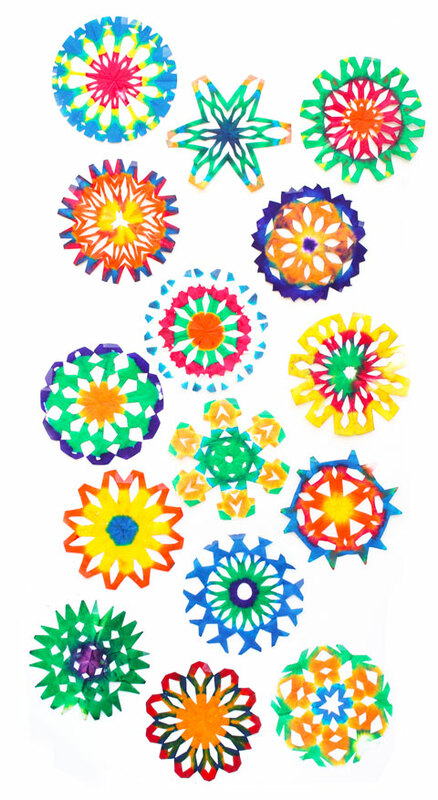 You can also use our snowflake template for ideas. Step Four Gently unfold the cut snowflake and lay flat to dry. These will dry fairly quickly once unfolded, around 30 minutes. To flatten these out, have an adult iron them. We used a medium setting and ironed them as you would a piece of clothing, NO WATER or STEAM PLEASE! 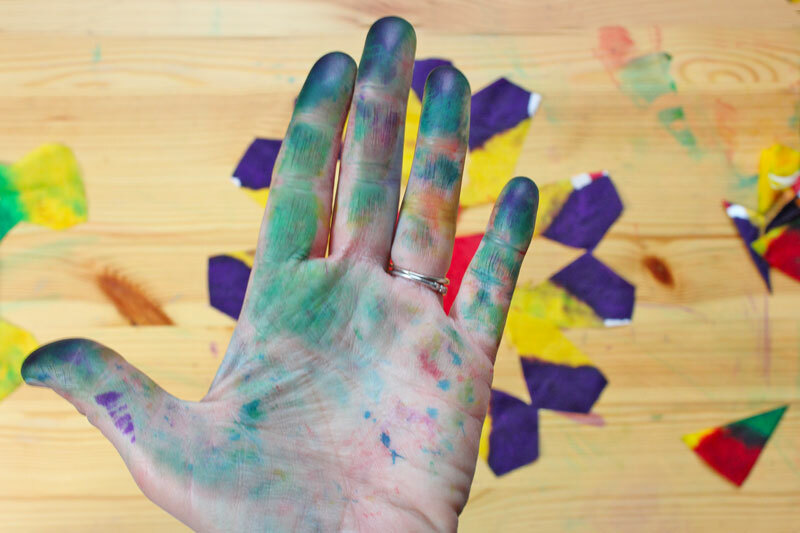 Don’t worry when your hands end up looking like this; a few good hand washings will remove the paint. Absorption is the process by which a material soaks up a liquid. Liquids like water are clear and it’s difficult to watch them be absorbed by different materials. 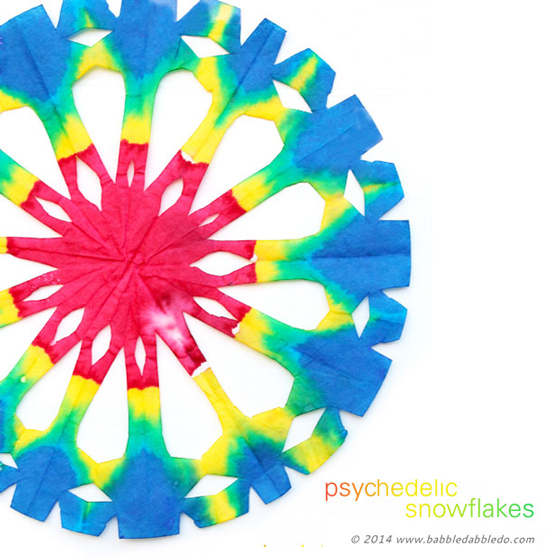 In the case of psychedelic snowflakes you can watch the coffee filters absorb the colorful liquid before your eyes and get a clear view of the process in action. Peter Max. Peter Max is an artist and graphic designer synonymous with the 60’s psychedelia. His work is colorful and fluid and bursting with energy. He designed everything from a postage stamp to ads to marketing for the Olympics to fine art. Here is his famous ad for 7-UP circa 1968 for which his style became well known. I personally love artists that hover between fine art and design and I think Peter Max has had a very successful career doing this. 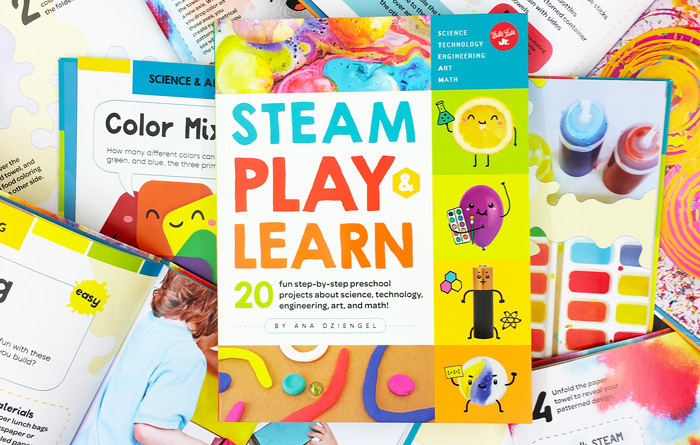 Psychadelic Snowflakes are part of the STEAM Kids Christmas eBook! 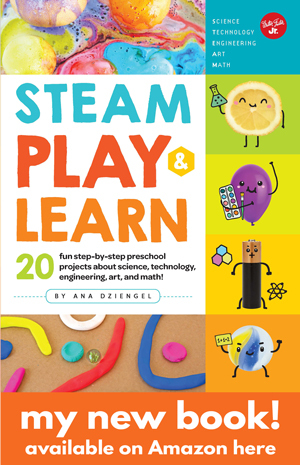 For more awesome ways to keep your kids creating and making during the long winter break go here to see the book. 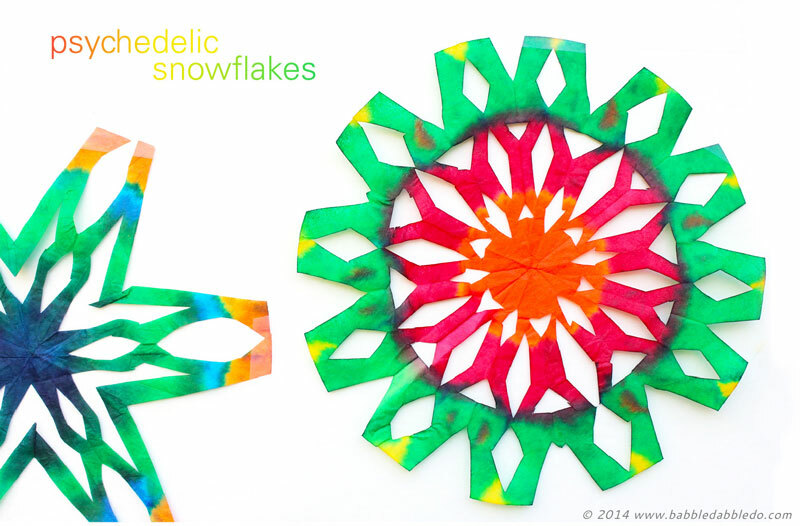 So if the only snowflakes you see this winter are a homemade snowflake craft, make it these giant vibrant lovely Psychedelic Snowflakes! And using undiluted liquid watercolors to dye them makes for vibrant eye-popping color! Hint: These would also look good as party décor any time of the year; they have a festive look to them don’t you think? I love this! 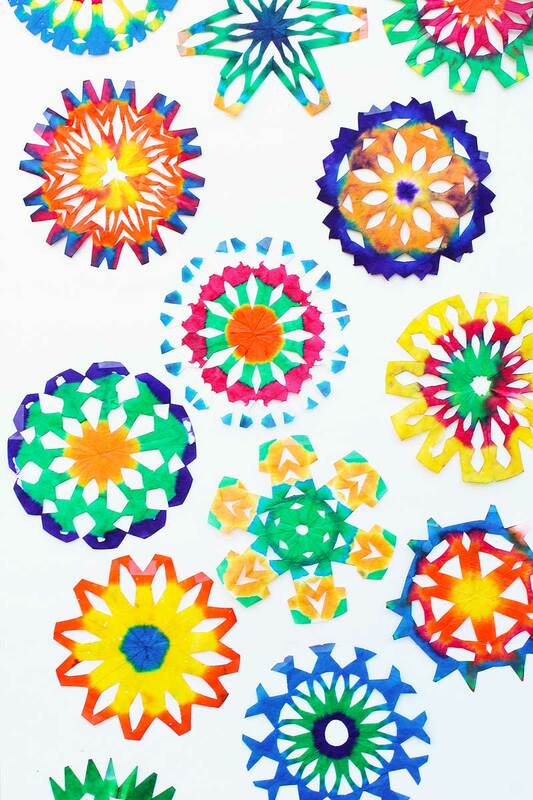 It reminds me of Mexican “papel picado” used to decorate festivities. You can also use markers and a spray bottle of water to create this effect, easier and not as messy as the dipping process. Thanks for including the artist tie-in with Peter Max. It is great when you can tie in art history to any activity! These look like so much fun. I can’t wait to try them with my art class. OMGSH i have been waiting for two years to finally make these! That’s it! It’s happening, & im not waiting for the large coffee filters. I’m sorry I just have to play with these bold colours asap!